I can't wait for this fantastic event which is being held in the Brentwood School Sports Centre in the heart of Brentwood. 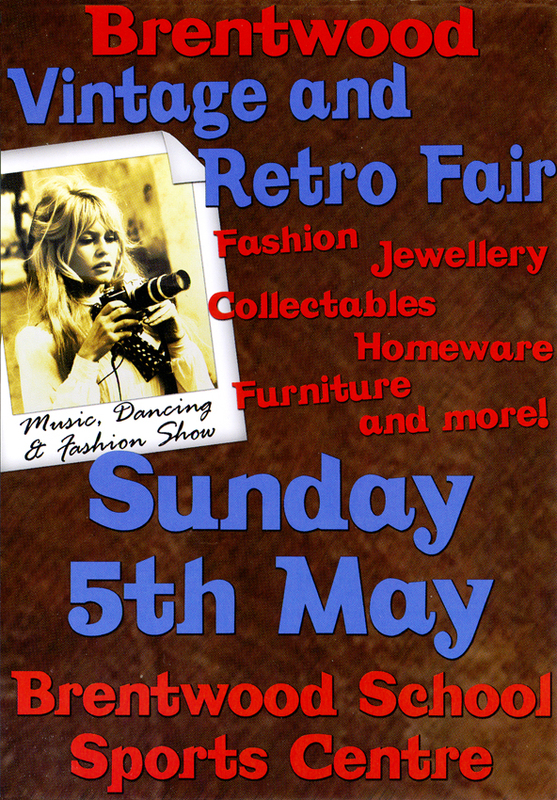 I'll have on display my usual selection of vintage inspired goodies, but with a few surprises. A whole new range of hand-knitted vintage style bags and many new items, just finished by my Mum! 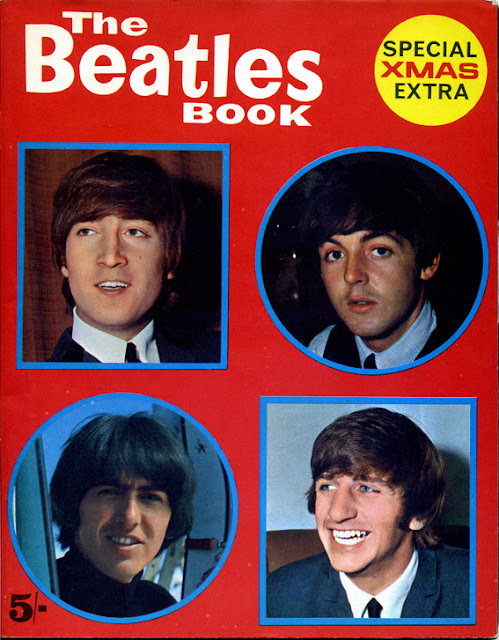 Also, a fantastic selection of books, including classic movies and music, a huge collection of comics and a great collection of retro Southend United programmes to choose from. Branching out even further I have some great retro French handbags! So you never know what you will find on my stall, come and check it out!!! 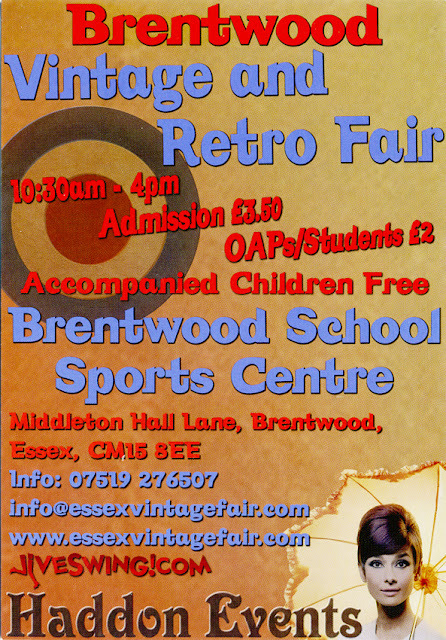 Kick off is at 10-30am until 4pm and admission is £3-50. PS: I'll be on hols in Devon and Dorset next week (HOORAY!! ), so here is some random picture to show you!! 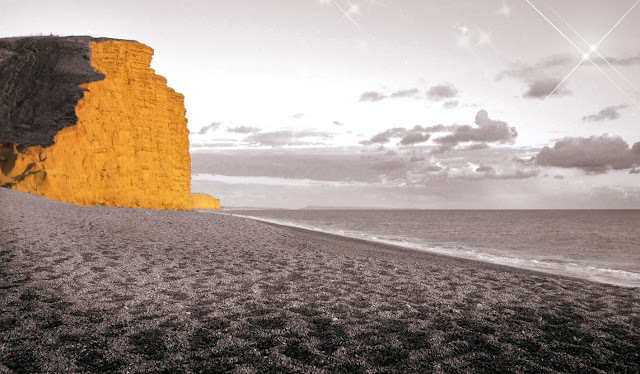 West Bay in Dorset, the scene of the recent TV series Broadchurch, and for older fans the infamous Reggie Perrin striptease!! 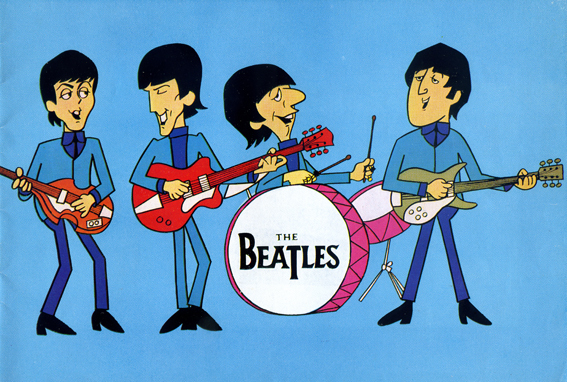 Yes, BEATLEMANIA is here again!!! I've just finished scanning some amazing BEATLES memorabilia that my sister has lent me. I'll be using these stunning original pieces from the 1960s for some new collages. I'm really excited to be working with this impressive collection. There are some rare and unusual items that are really commanding huge prices on the internet! The Beatles Book from Christmas 1965. 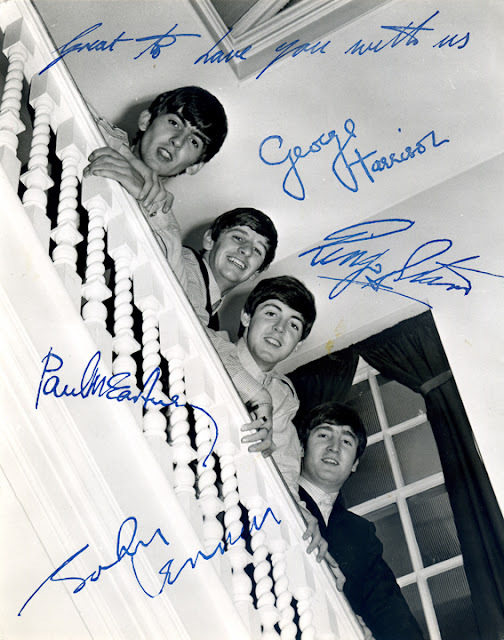 Unfortunately not real autographs!, but this fan club photo is actually very sought-after. Fab cover of a concert programme from 1965. 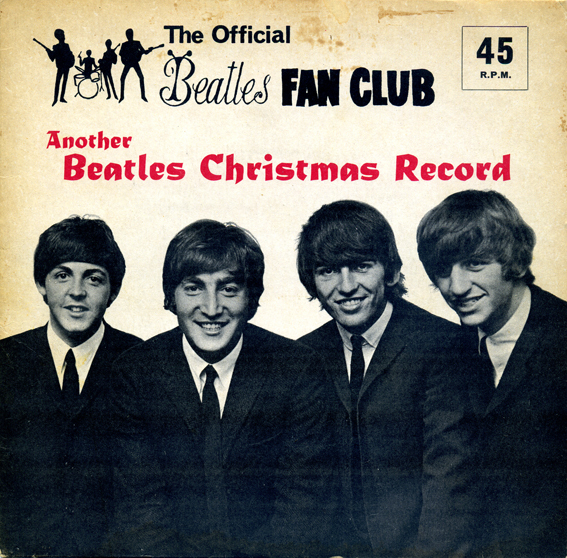 Fan club Christmas record from 1964. 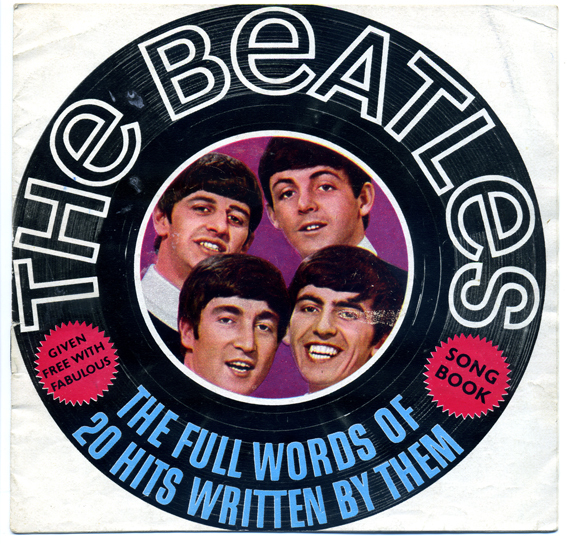 Great 60s design on this Beatles songbook. From the blue half of Merseyside... EVERTON. I've put together this tribute to the famous old club using items from my own collections, some dating back to the 1920s. Striker JOE ROYLE presides over proceedings here. 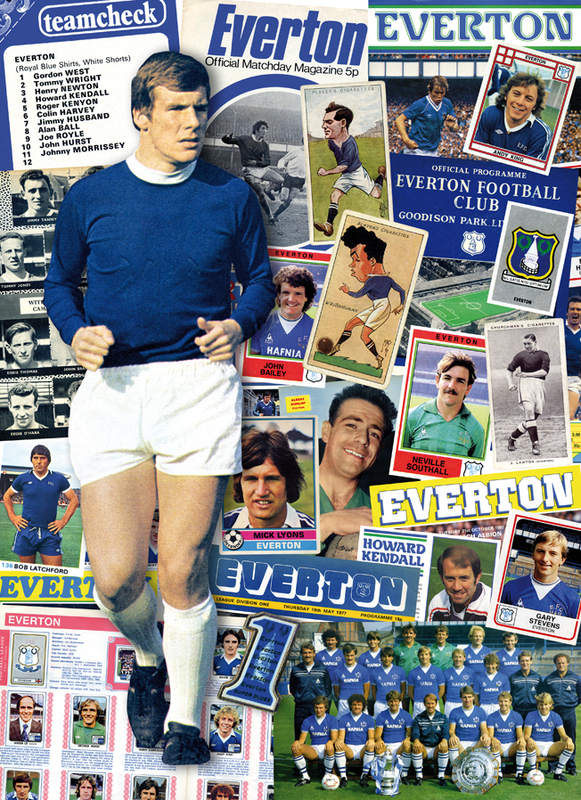 I chose him as not only did the burly frontman win the League title with EVERTON in 1970, but he also won them the F.A. Cup as manager 25 years later. A truly iconic figure in the club's folklore. I have a great selection of the Toffeemen's programmes, so I was able to introduce a few here. 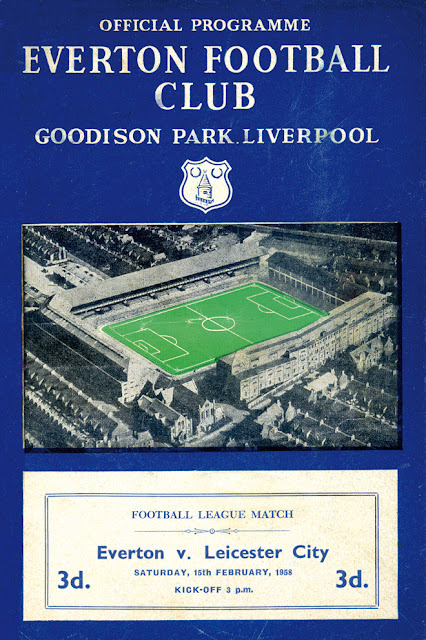 The oldest one, from 1958, shows their Goodison Park ground in all its glory. There is a number of 70s and 80s programmes as well, but my favourite is the one from 1971. With its startlingly bold and simplistic design and typography it stands out head and shoulders above the rest. See below to see what I mean! 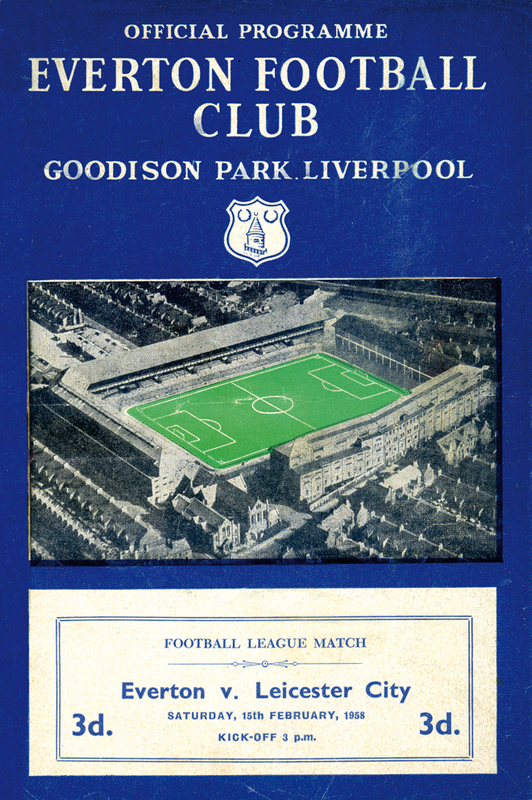 Interesting to see how Goodison Park looked in 1958. 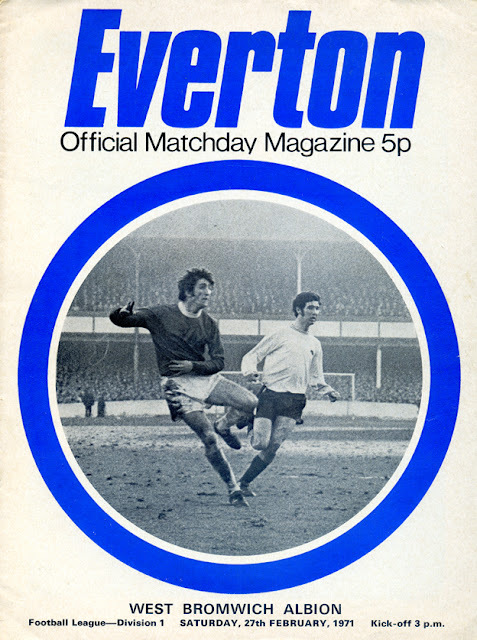 Fantastic bold design on this 1971 programme, featuring striker David Johnson. I found a great line-up of player portraits from the 1959/60 Charles Buchan's Soccer Gift Book. Also in there was a poster of loyal 50s goalkeeper ALBERT DUNLOP. 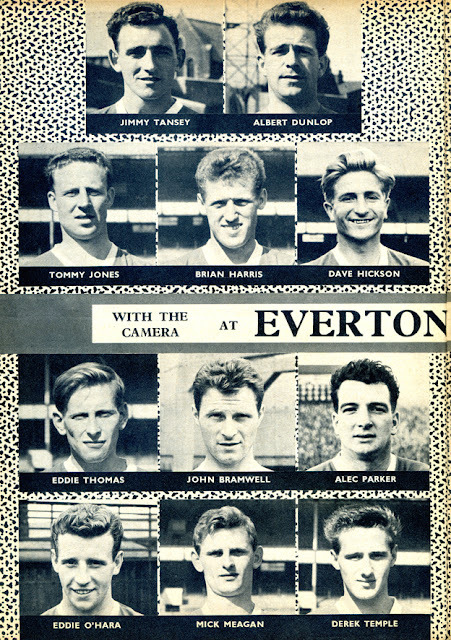 Great portraits from the 1959/60 squad. Amongst my collection of enamal badges was a typical 70s Coffer Sports badge, in the shape of a number 1. Classic badge from the 1970s, with the Prince Rupert's Tower in the background. Classic stickers are also featured. From the 1970s, a club badge, goalscoring machine BOB LATCHFORD and bustling midfielder ANDY KING, legends of the trophy laden 1980s teams are represented by NEVILLE SOUTHALL, JOHN BAILEY and GARY STEVENS. There's also a trading card from 1977 of defender MICK LYONS. 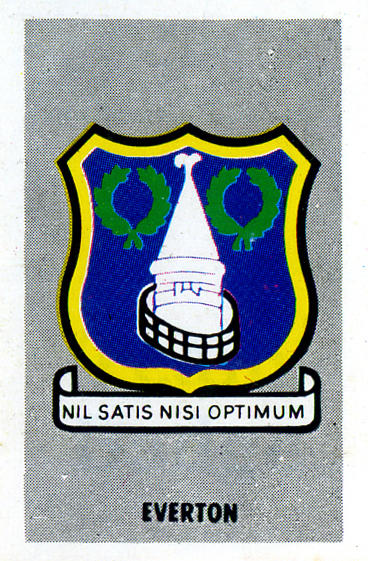 Club badge from Football '76 sticker album. 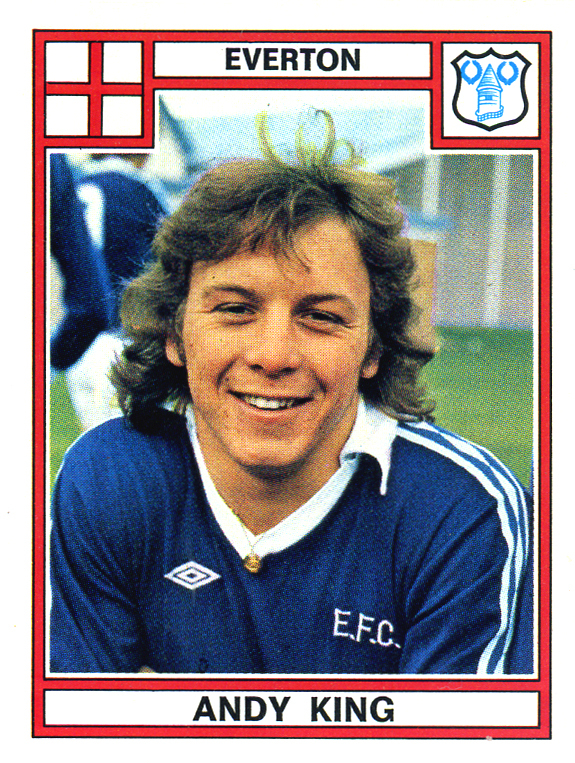 An Evertonian favourite from 1978. Going further back in time are the cigarette cards. One is of SAM CHEDGZOY, a Canadian born winger from 1926 and England striker TOMMY LAWTON from 1938. Curiously, this card is captioned J. LAWTON, an odd mistake for such a well known player. Note the mistake, he was definitely a T! My absolute favourite item of the whole collage is the cigarette card of DIXIE DEAN. This fabulous portrait of the famous striker is by MAC and dates from 1927. 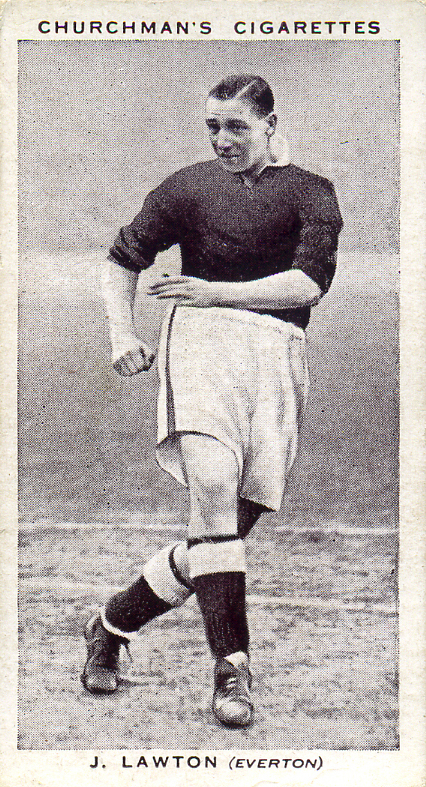 Dean was a phenomenal player, who fired his team to the League Championship in 1927/28 by scoring an incredible 60 goals. A record never likely to be beaten. 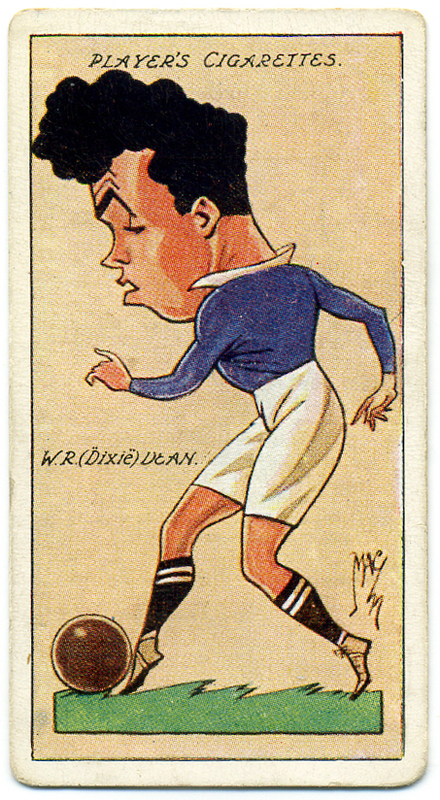 The wonderful Dixie Dean card from John Player & Sons. 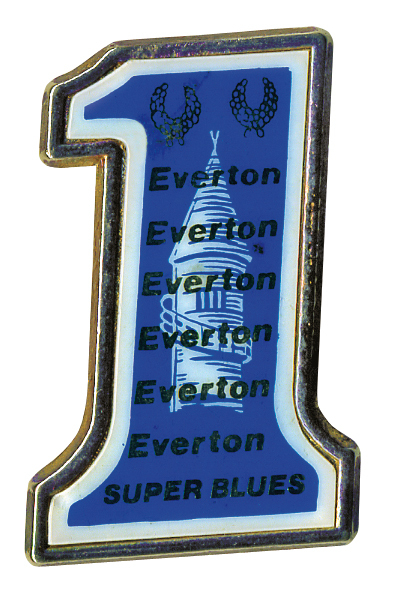 I hope all EVERTON fans will enjoy this historical journey through their history. I'm stil hunting through the ArtPix archives to find other teams to do. I recently started a QPR collage, but realised I didn't quite have enough items to do them justice! I have quite a lot of material from CHARLTON, LEYTON ORIENT and CRYSTAL PALACE, so I may do those next, as I really want to do all the London clubs. Watch this space! 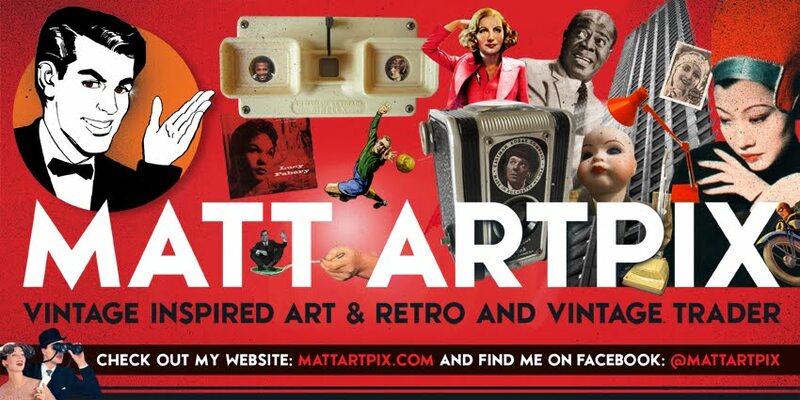 And also check out my website to view all the other footie collages I've done so far. 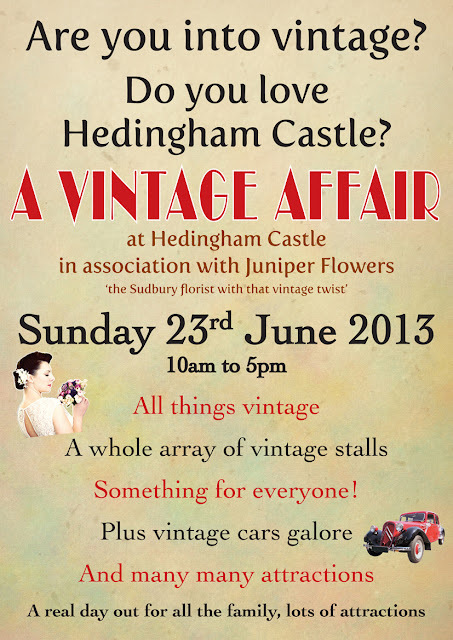 I'll be at the very exciting new venture A VINTAGE AFFAIR AT HEDINGHAM CASTLE. 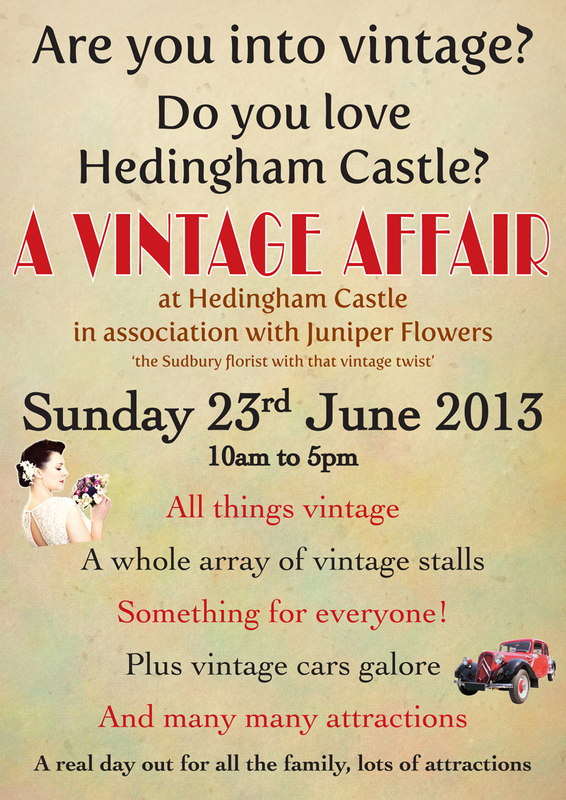 There will be all sorts of amazing vintage events going on here. Lindy hopper dancers, a Rockabilly band, hair stylist, classic cars and of course splendid vintage stalls! 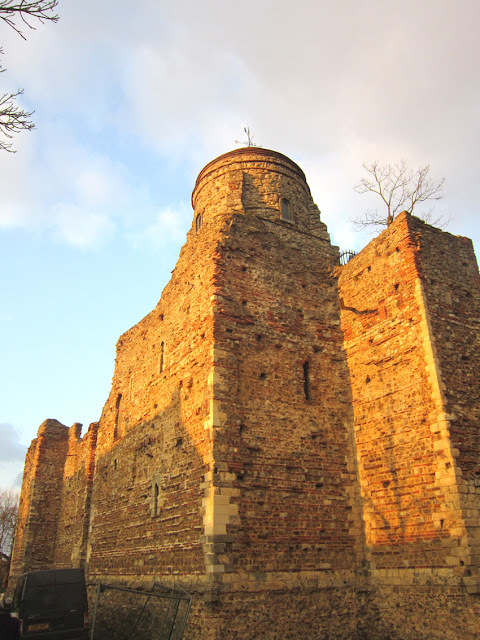 All this set in the grounds of the magnificent Norman castle, which has the best preserved Norman keep in the country. An absolutely stunning location for a vintage fair. Put this date in your diaries now!! Special mention to the organiser Anne Brown for putting together what's going to be a brilliant day. If you are down Sudbury way, check out her beautiful shop, Juniper Flowers! The beautiful poster for a beautiful day! 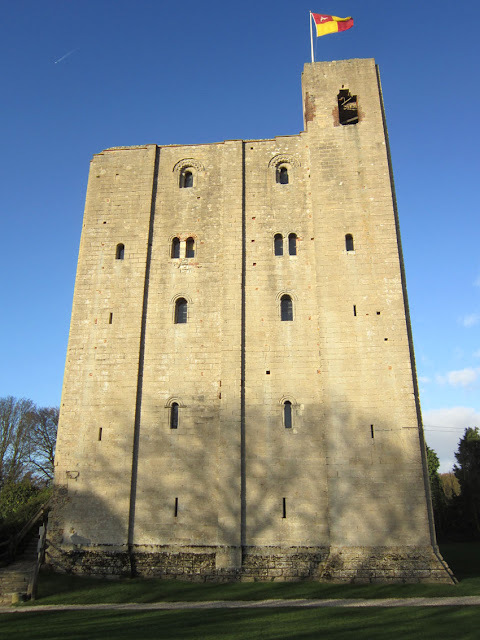 The stunning Norman keep, just look at the size of it! 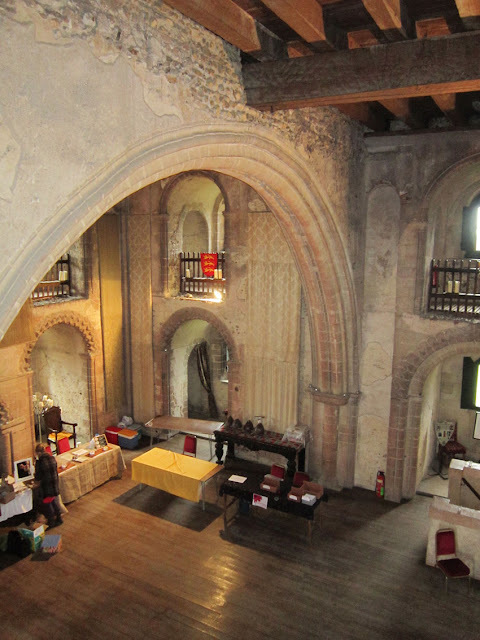 Inside the keep, with the immense arch, one of the largest Norman built arches in the country. WOW, what an amazing day I had last Saturday!! 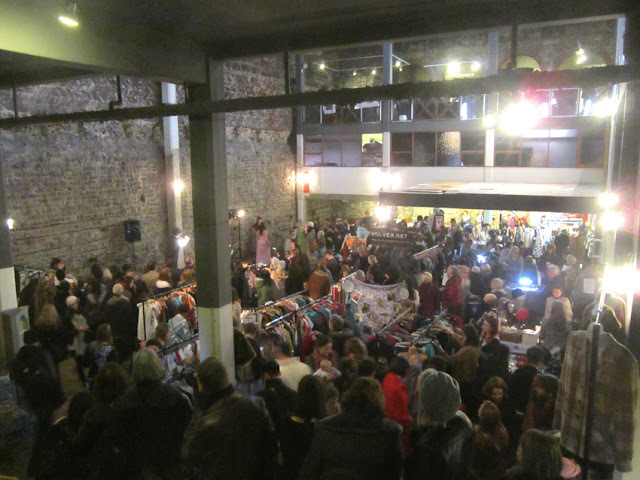 It was a spectacular event, with 80 stalls, fashion shows and music. 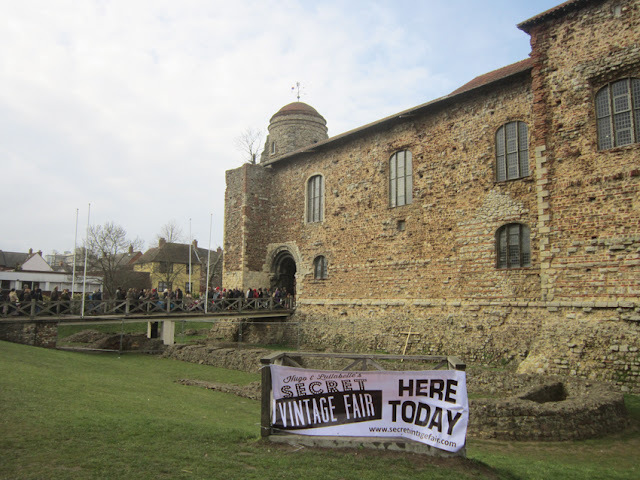 Colchester Castle was absolutely heaving with people. We didn't stop all day, as the queues to get in were outside the castle and going right down Museum Street! The day was kicked off by the splendid Curious World of the Grymoire, who performed a ditty especially written for the day. From our amazing view from the balcony we were able to see the various performers throughout the day, including The Hayward Sisters and the vast ensemble of the Funky Voices. It was such a great experience to be in such a fantastic building. I met so many great people and although I didn't get the time to see all the stalls, the ones I saw were choc-a-bloc full of amazing goodies! I'm also very pleased to say, I had record-breaking takings for the day, HOORAY!!! Top marks to the Secret Vintage Fair team for organising this immense event, I can't wait for their next one! The spectacular castle, and just look at that queue!! 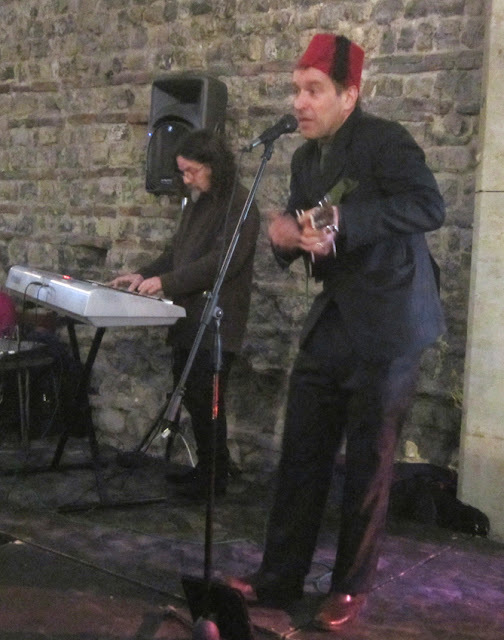 The brilliant Curious World of the Grymoire performing their special ditty. The crowds are already building up! 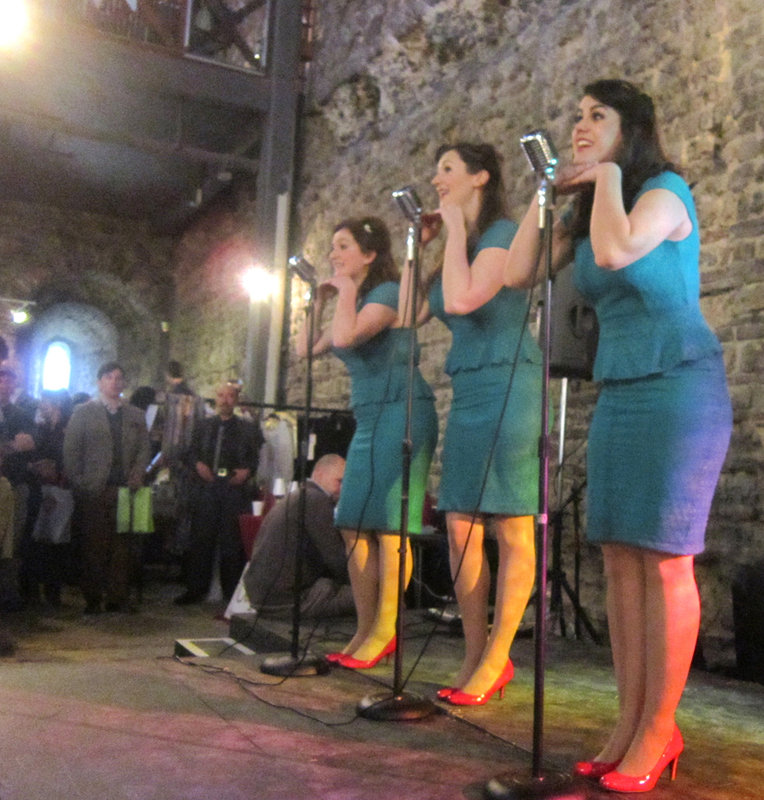 The Hayward Sisters in full flight! 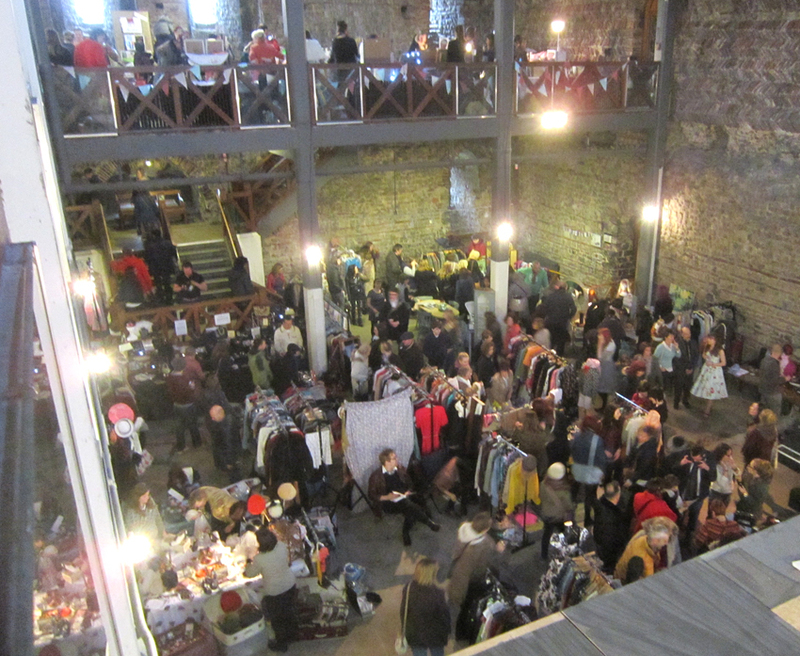 A view from the stairs, giving you an idea of the crowds inside! A perfect end to the day, a lovely sunset over the castle!